Clarence "Little Fred" Surdam of the Bakerville district of New Hartford was born May 8, 1916 in New Hartford, son of Katherine (Pulver) and Frederick Surdam. 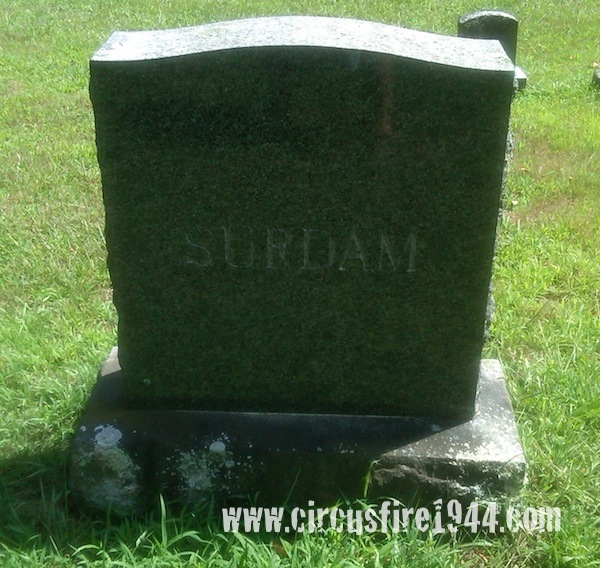 He was found injured at the circus grounds after the fire on July 6 with extensive second and third degree burns to most of his upper body. In extreme pain and burn shock, Clarence was admitted to Municipal Hospital and treated with plasma and morphine. On July 7, he became irrational, then comatose, and passed away later that night and was buried at Bakerville Center Cemetery in New Hartford after services at the Shea Funeral Home. 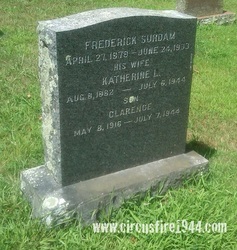 Clarence's mother, Katherine Surdam, was also a victim of the fire, and his father died in 1933. He leaves a half-brother, Earl Pulver, 44. Clarence's cousin Eldoras Bergin attended the circus with the Surdams and also died from injuries received in the fire. Prior to his death, Clarence ran a chicken farm in the New Hartford area, with which his mother helped. The estate of Clarence Surdam was awarded $12,500 by the arbitration board.